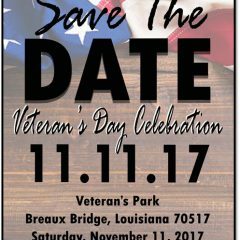 Veteran’s Day ceremony will be held at Veteran’s Park at 222 Berard Street on Saturday, November 11 at 10:30 a.m. For more information call 337-332-8500. Trick or Treating will be held in Breaux Bridge on Tuesday, October 31 from 6 PM to 8PM. Please drive carefully. Giving our children a safe place to Trick or Treat! Join us in Parc Hardy on Saturday October 28th from 4 PM – 7 PM. Come park you car and decorate your trunk.. Want to save your spot or make a donation to help, contact Jill Bozeman, Principle at Breaux Bridge Primary School at 337-909-3840. Boo Bash will be held at St. Bernard School on Sunday October 29 from 4 PM – 7 PM.